Bringing style to your table isn’t just about having great food and drink. The right dining room table linens can bring the right atmosphere to your space for any occasion. Set a calming mood for Sunday dinner, fancy things up for a Christmas party or celebrate the arrival of spring with just a few well-placed table coverings. Collections Etc. has a large assortment of decorative table cloths, table runners and place mats that will accent both your current décor and the colorful dinnerware you’ll be setting on them. A full table cloth is an excellent backdrop for a tasty spread and also make post-meal clean-up much easier. 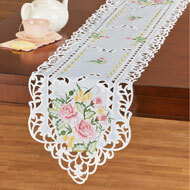 Our dining room table cloths come in all sizes for round, square or rectangle tables. 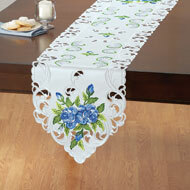 A standard single-color tablecloth is a fine complementary linen for everyday or special use. But if you want to get fancy — and who doesn’t from time to time — you can find lace table cloths, fitted table covers, themed harvest linens and other fun décor. 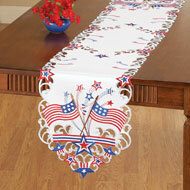 Our table runners are where you can really show off your decorating skills. We offer gorgeous table runners for every season and passion, including Easter table runners, Christmas table runners, decorative lighthouse table runners and floral table runners. These linens are a simple and affordable way to spruce up your dining room for entertaining guests. Better yet, you can coordinate them to a table cloth or let them stand out on their own. With a table runner and placemats set, you can have an HGTV-worthy table without needing an interior designer degree or budget. 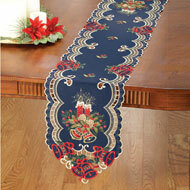 Whether you’re looking for a festive round table runner or an elegant mantle scarf, Collections Etc. has something to help you put the finishing touches on your dining experience. Shop today and explore all of the great values we have on kitchen & dining accessories for your home.